There is a discussion going on in Holland about Polish workers. Some people blame them to work for too low a salary and are therefore creating false competition for Dutch workers. As long as the costs of living aren't about the same in both countries, there is nothing to do about it and it is quite understandable too. They can work for 5 months in Holland to earn more money than they get in Poland working a year. But you can also start a metal band. 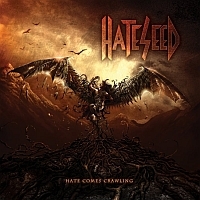 Off course you already guessed that Hateseed hails form Poland and this is their first record. I read in the info that they are inspired by Blind Guardian, Mercyful Fate, Iron Maiden, Helloween, Megadeth etc. etc. Reading all this, you expect power metal with choirs and a heavy touch. The heavy part is there, the power metal influences and there are thrash influences too. The guitar leads are indeed inspired by Iron Maiden, so far nothing's wrong. But and there are almost all the time some buts; the vocals and the production are not good enough to make this a real good album. The vocals of Lukasz Szostak has a Hansi Kürsch kind of sound (like in the song "Exile"), but they can't impress me. I hear the potential the band has and Lukasz is really doing his best, but he is limited as a singer. With a better production, a little bit less predictable compositions and better vocals, the next album could give them a boost.